Time to bring in the new year the right way: by partying of course! Welcome to the 2017 New Year's Eve Party Guide DC. We have summaries and ticket links to some of the wildest New Year's Eve parties in DC. If you need even more details on the event that best suits your party needs, follow the links or email us. Have a great night of dancing, smooching, and let the champagne flow. Stay safe, and Happy New Year 2017!!!! Ladies & Gentlemen, Behold The Belvedere Ball at Station 4 Ultra Lounge. Anchoring the Southwest Waterfront Station, Station 4’s a swanky bistro serving up “global cuisine” from a chef late of Barcelona’s molecular gastronomy standout El Bulli, and boasts a 40ft gold-painted bar, columns and walls shimmering with black river stones, pushpin leather couches, and teardrop-crystal chandeliers. 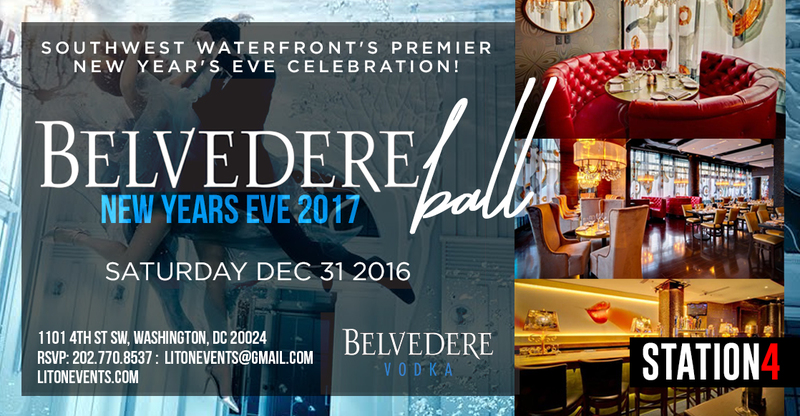 We welcome you to attend the one and only New Year’s Eve gathering that Southwest Waterfront area has to offer. How much: Tickets are only $25 for the those who purchase tickets early, the price will go up as the event date gets closer. The hot setup: find a friend and buy a couples ticket, you get a pretty good discount by doing it that way. Click Here for Tickets - Early Bird Tickets ! New Years New Year's Eve 2017 at Maté will be like no other party. Come and enjoy Complimentary Two hours of sushi and Latin fusion cuisine followed by a midnight champagne toast. Mix all that with amazing beats by DJ Pandu, some new crafted cocktails, and your favorite friends - you will have set the tone for a fabulous year! How much: Tickets are only $35 for advance tickets, we have heard that tickets are selling fast so get yours now. Click Here for Tickets - Early Bird Tickets are selling fast! You are cordially invited to Celebrate New Year’s Eve 2016-2017 in true Parisian style at the Gorgeous Malmaison Ballroom. Spend the night with us and immerse yourself in a magical atmosphere of the past – all the while toasting to your bright future. Behind the decks on the night will be the charismatic DJ Benny C., who will provide your favorite Top 40 tracks of past and present. Revel in a night of elegance and splendor at the Midnight in Paris New Years Eve soiree. How much: Tickets are only $35 for the early birds, but the price goes up the closer to the event you try to buy tickets. The hot setup: find a friend and buy a couples ticket, you get a pretty good discount by doing it that way. Manor is another swanky spot to enjoy your New Year’s Eve. It’s the best if you want to watch the streets erupt in celebration – the floor-to-ceiling windows in this lofted lounge have a great view of Connecticut Ave.
How much: Tickets are only $35 for the early birds, but those seem to be sold out, so try to buy the plan and save tickets. Click Here for Tickets - Early Bird Tickets have already sold out! Join us for ZooFari, the premier culinary event featuring more than 100 of the top DC restaurants and vintners–all in the wild setting of the Smithsonian's National Zoo. In addition to a delicious evening of food and fine wines, ZooFari offers a night of unforgettable entertainment with live music, exotic animal encounters, a silent auction, and much more. Best of all, ZooFari proceeds support the Zoo's mission to save species! Complimentary food tastings from the more than 100 participating restaurants. Cocktail tastings with seasonal and gourmet ingredients crafted by celebrity bartenders and popular mixologists. The Small Mammal House, the Great Ape House, and the Reptile Discovery Center that will be open for guests to learn more about some of the Zoo's most popular residents. Animal encounters along Olmsted Walk. Three mega-bars located throughout the event offering complimentary beer, wine, soft drinks, and water. Giveaways, courtesy of lead sponsor GEICO, and Rosenthal Jaguar/Land Rover. LivingSocial Lion Lounge – This private area, held at the Zoo's Great Cats Exhibit, is during the main event and offers a unique opportunity to view the cats at night with demonstrations and keeper talks. Specialty food and drinks as well as live entertainment and musical performances will be offered. Premier Pavilion – Located on the Zoo's Great Meadow during the main event, this area offers seating, festive decorations, a private bar, exclusive animal encounters, interactive and musical entertainment, as well as select food offerings. If you have any questions regarding VIP ticket packages, you may email LaShawn Harris or call her at 202-633-3034. ZooFari is primarily an adult event. Tickets are required for children ages 2 or older. To be served alcohol, guests must be at least 21 years old and present a valid photo ID. Due to space limitations, strollers will not be permitted. Shuttle service is provided from the Woodley Park/Zoo Metro Station, courtesy of Big Bus Tours. The shuttle will run from 5:00 p.m. to 10:00 p.m. throughout the night. Sugar & Ice–And Everything Nice! Potomac Point invites you to forget everything you thought you knew about dinner-and-a-movie date nights with this romantic deal, which gets you two tickets to an upcoming outdoor summer movie at Potomac Point Winery in Stafford. Watch an illustrious sunset transform the horizon into a tapestry of twinkling stars before making your way into the vineyard to enjoy the featured film of the evening. Want to enhance your viewing pleasure? Bring along a picnic blanket and/or lawn chairs. The outdoor movie series takes place throughout the summer on a 16-foot screen with LCD high-definition projection. Wine, cheese boards, and ice cream will be available for purchase, if desired. Becky's Fund cordially invites you to our 7th Annual charity fashion show event, 2015 Walk This Way, to benefit Men of Code on Thursday, November 19, 2015. Come join us as we watch professional athletes walk the runway in Canali menswear and take a stand against intimate partner violence. For more information about available sponsorships and the event, please visit www.wtwevent.com or email info@beckysfund.org. Come join us and check out the latest hair and makeup trends for fall, a preview of "Voices," and get your tickets at early bird pricing! Space is limited so please RSVP now to victoria@vmpublicrelations.com. After a massive turn out for their friends and family soft launch of Cities DC re launch. The venue is finally is having their grand opening as Cities 2.0 since moving from their 919 19th St address. Since originally opening in 2011, Cities Restaurant and Lounge DC has created a reputation as the newest standard in Washington DC nightlife which is a rarity. 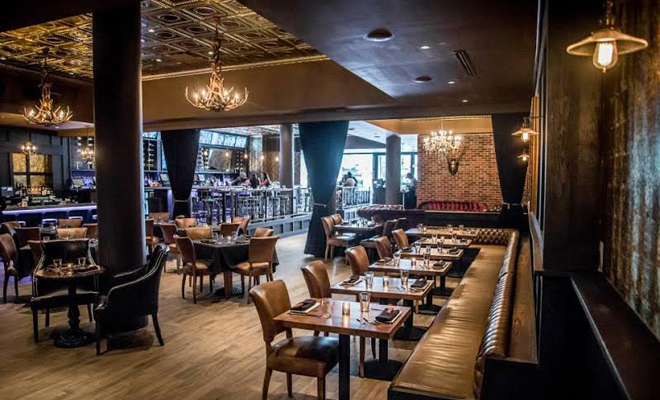 While upscale lounges and nightclubs in the District often come and go, only Cities DC has developed the heightened sense of showmanship and customer experience that was previously lacking in the nation’s capitol. With such esteemed notability in such a short period of time, this premiere party hall also quickly became the hottest new event space for private parties. In addition to a sophisticated atmosphere and state-of-the-art amenities, corporate functions and charity fundraisers look to Cities Restaurant and Lounge DC as their go to event space. Join Reach for College on Thursday, June 4, from 6 to 9 p.m. at The Gryphon, one of DC’s most popular restaurant and nightlife venues, for the Dream Big party benefiting Reach for College, a DC-based charity focused on providing higher education access to traditionally under-served children. Come join a number of other DC-area professionals and socialites for a night of fun, great prizes and drink specials, great beats by DC’s DJ Vicious, and a truly great cause. Sip Fortaleza Tequila Specialty Cocktails, bid on great items like Wizards court-side tickets, a Rent the Runway experience, VIP nightlife experiences, Nationals’ tickets, and restaurant gift certificates. What You Get: Besides helping America’s youth … happy hour prices from 6-7 p.m., then $4 domestic beers and $5 house wine 7-9 p.m. & complimentary specialty Fortaleza Tequila cocktails throughout the night. Tickets: $30 admission, which will provide access to drink specials, passed hors d’ouerves, and the opportunity to bid on and win prizes, and will also sponsor a student to help them prepare for and attend college. 100-percent of contributions along with a portion of bar sales will go to Reach for College. To purchase tickets in advance, please visit http://reachforcollege.org/tickets/dream-big-party. If you believe that any content appearing on LITON EVENTS Blog infringes on your copyright, please send us an email at litonevents(at)gmail.com, including following information to us and the infringing material will be removed as soon as possible. (a) your name, address, telephone number, and e-mail address;(b) a description of the copyrighted work that you claim has been infringed;(c) the exact URL or a description of each place where alleged infringing material is located;(d) a statement by you that you have a good faith belief that the disputed use has not been authorized by you, your agent, or the law;(e) your electronic or physical signature or the electronic or physical signature of the person authorized to act on your behalf; and(f) a statement by you made under penalty of perjury, that the information in your notice is accurate, that you are the copyright owner or authorized to act on the copyright owner’s behalf.